It's hard to believe, but today marks the 1,000th blog post at Jewish Humor Central. We started this blog back on Sunday, October 4, 2009 with a welcome to our handful of readers and followed up the next day with our first posting, which you can see at the bottom of this page. What was the first blog post? A review of two "ultimate books of jokes," Oy! and Oy Vey: More! by David Minkoff. And so on it went, day after day, with more jokes, video clips, funny happenings around the world, musical interludes, hilarious Israeli commercials and Jewish holiday humor, flavored with some Yiddishe nachas. We're thankful to you, our loyal readers, more than 3,000 email subscribers plus countless Facebook and Twitter followers for staying with us and hopefully getting your days off to a brighter start. The blog has grown and now it's also a series of eight books and eight lectures on Jewish humor which will be coming to Scranton, Pennsylvania; Jackson, New Jersey; Deerfield Beach, Florida; and Jerusalem in the next three months. So how to start this day in a very special funny way? We're going for a virtual ride in a Rolls Royce with Jerry Seinfeld and Carl Reiner as they head for a breakfast shmooze in a Los Angeles diner. 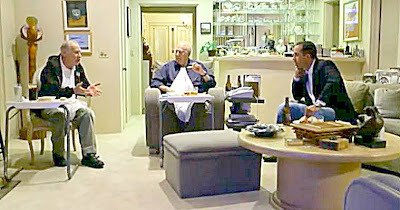 Later that evening, Seinfeld and Brooks visit Reiner at his home for a takeout dinner and longer shmooze filled with anecdotes about their show business careers, tossing out a few old jokes and nostalgic recollections. It's one of a series of episodes of Comedians in Cars Getting Coffee, a Seinfeld-produced web series where Jerry rides with a different comedian in each episode to have coffee in a different restaurant. Like his TV show, it's "a show about nothing," but we feel it's energizing to be in the presence of these geniuses of comedy. It's not a rip-roaring hilarious session, and we could do without Carl Reiner chowing down on chazerai, but it's fun to see these masters of the stage and screen enjoying themselves in the comfort of a private home. Enjoy the visit, and take a look at the first Jewish Humor Central blog post just below it. 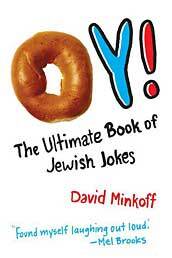 David Minkoff has probably compiled more Jewish jokes than anyone on the internet or in the universe. Last month his second "ultimate complilation" of Jewish jokes, "Oy Vey: More" was published by Thomas Dunne/St. Martin's Press in hardcover. Sadie is in Israel on holiday and goes to the post office to buy some stamps for her Chanukah cards. "Can I have 50 Chanukah stamps please?" "Of course," says the clerk, "what denomination?" "Oy veh," says Sadie, "has it come to this already? OK, give me 14 Liberal, 28 Reform Orthodox stamps please." Rabbi, am I permitted to ride in an airplane on shabbes as long as my seat belt remains fastened? Surely it can then be considered as if I'm wearing the plane? And so it goes, with topics including romance, family fortunes, medical jokes, life and death, people and professions, matters of faith, and even a few pages of child-friendly jokes. Both books will give you one-liners, gags, riddles, and shaggy dog stories to share with family and friends, if you can get used to the British inflections and conventions such as money in pounds instead of dollars and British spellings and usage. Some of the jokes are a bit off-color, such as What brocheh does one say before taking Viagra. The first book, Oy: The Ultimate Book of Jewish Jokes is now out in paperback. I keep a few copies on hand to give as get-well gifts to friends who have been hospitalized. They say that laughter is the best medicine, and I include a fake prescription blank recommending two jokes three times a day and three jokes just before bedtime. It works wonders! This was WONDERFUL!! What a great idea! The humor of these three guys can't be topped!!! Thanks! !